Wow - what a great episode...we start off with Sayid killing the chicken that his brother couldn't. 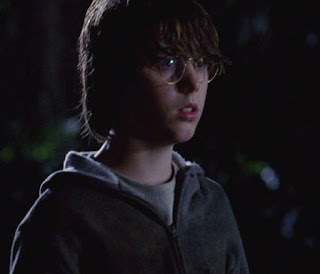 Kudos to the Lost Casting Director for hiring Sterling Beaumon to play the young Ben Linus. What a spot-on portrayal of Ben as a 12-year old. He had the character that Michael Emerson created exactly right. Shooting Ben – he’s obviously going to be ok…he will heal from the gunshot wound, just like Locke did. But still cool to see him get shot, even though I did cringe at the sight of the shooting of a 12-year-old! On top of that, I think it shows a real impetus for his character being so aggressive and untrustworthy…Sayid, who he thought was a ‘hostile’ shoots him…the one person he trusted when he thought he couldn’t trust anyone, the person he turns to after “Roger Workman” rips into him, doesn’t only betray his trust, but tries to kill him! Also – if he does heal, this could be the first time that Ben realizes that the island has special power. I wonder how much Sawyer/Juliet/Jin/etc know about the overall island/secrets/etc., i.e. – what is Smokey? What is the nature of the island? Who are the hostiles? Yadda yadda…I want to see more of Sun and Frank. Did you catch that there was a silhouette of Claire in the background as Christian Shepard was speaking to them? I would really like to get more information on Claire…and maybe see a Claire-Kate confrontation. My good friend Elad let me know that Oldhan was played (marvelously) by E.B. Farnum from Deadwood (didn't get to watch before making aliyah). What a chilling performance...he definitely comes from the 'less is more' school of acting, but that made it all the more chilling. Note to Mr. Sayid Jarrah...when a woman orders a ribeye - bloody, don't ask her if she is a professional. You'll like this piece of trivia: you remember Sayid killing the Russian guy, Andropov, in the building in Moscow. Well, as Sayid is leaving you see the building's name in Russian letters spelled backwards. The building is called "Oldham Pharmaceuticals." Who said spending a year in Russia wouldn't be helpful someday?